Provide comfort for the family of Mary Ainsworth with a meaningful gesture of sympathy. 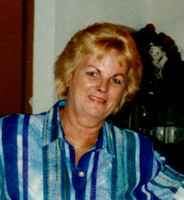 Mary Louise Ainsworth, 82, of Bushnell, FL, passed away Friday, March 15, 2019, in Bushnell, FL. She was born in Cincinnati, Ohio to Frank and Serafina Rolfes. She is survived by daughters: Theresa Ann Betancourt of Miami, FL, Cindy Lee Marcotte of Bushnell, FL, Cathleen Louise Ainsworth of Miami, FL; 8 grandchildren and 5 great-grandchildren. A service will be held on Friday, March 22, 2019 at 1:00 p.m. (with visitation from 11:00 to 1:00) at Purcell Chapel, with Pastor Bob Brubaker officiating. Interment will follow at Pine Level Cemetery in Oxford, Florida. To send flowers in memory of Mary Louise Ainsworth, please visit our Heartfelt Sympathies Store. 4552 Pine Level Cemetery Rd.